The Strategic Organizational Management Index (STORM Index) is a proprietary process that reveals and uncovers your employee’s perceptions, attitudes, strengths and weaknesses which impact your corporate performance and profit. The STORM Index is scientifically valid and reliable. It identifies what other assessment tools ignore or miss altogether. Before you buy or sell an organization, before you make changes that impact performance, profit, and involve human capital get an accurate measure via the STORM Index. Armed with the STORM Index’s data-driven information, decisions are more strategic, more effective—enhancing your business’ ability to compete, flex, and grow. The survey is completed on line, and the data is automatically routed to the Workplace Consultants, Inc, analysis center. The STORM Index is adaptable to your specific problems, issues, concerns, and industry. It can be combined with your existing organizational assessment activities. The STORM Index combines the best of both qualitative and quantitative research into one highly effective assessment instrument. Not only do you get the “What” you also get the “Why” and “How.” Rather than getting just a mean score, or a frequency distribution, the STORM Index provides an in-depth verbatim analysis that drives the numbers. Results are also benchmarked against national norms. The STORM Index works to reconstruct a group’s (not an individual’s) psychological predisposition based on the distribution of thousands of free-associations to a series of strategically selected work-related criteria. 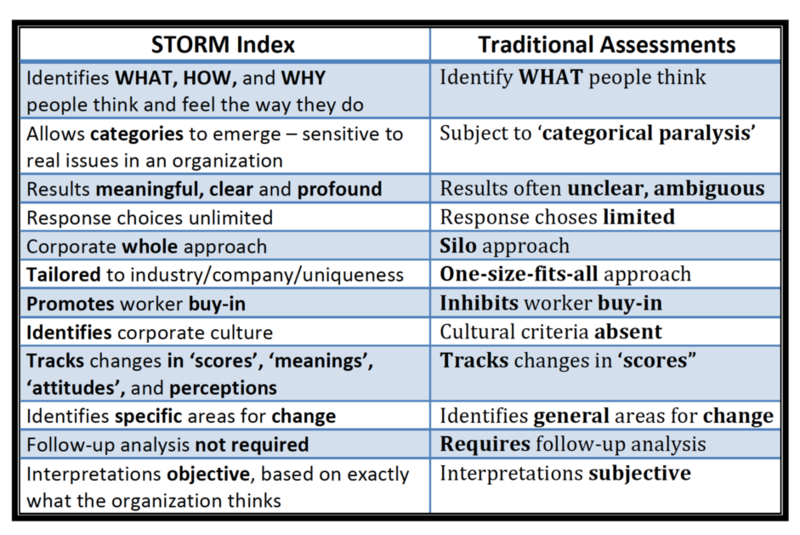 Through extensive computer-assisted analyses, the STORM Index is used to identify behavioral, managerial, cultural and systemic dispositions to organizational weaknesses and strengths evasive to more direct methods of assessment. The STORM Index also identifies the culture of an organization because its methodology allows for accurate assessment of a group’s words and perceptions toward the organization. The true culture becomes evident through the group’s responses. The free associations highlight the main components of a group’s or workforce’s subjective perceptions and impact the evaluations. Each response has a score value. These values reveal how salient a particular idea or attribute is as an element of the group’s perception of the work-related factors (e.g., SUPERVISION). The responses provide a rich information source that reflects the group’s understanding of the work-related factor, including perceptual and affective details which arefrequently not verbalized and below their level of awareness. These responses have significant implications for communication and behavior (e.g., will I quit, look for another job, work harder, be creative or innovative, be cooperative, etc. ), the health of the worker (e.g., stress, illness, absenteeism, etc. 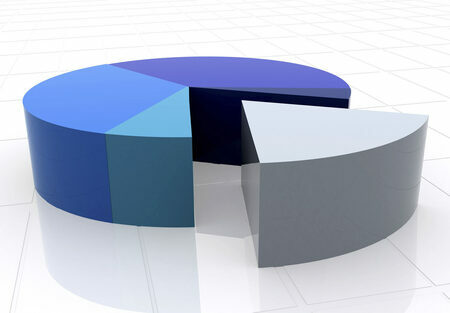 ), and the health of the company (e.g., profit, productivity, performance, quality, competitiveness, etc.). To illustrate, based on the responses, a workforce may actually like stress and feel high stress is necessary for their performance while another workforce may not. Or, one department may perceive “quality” as very salient while another department may not view it that way at all. The responses provide specific insights into what a group is perceiving, and why they are thinking and feeling that way (including relevance and importance to them). With regard to content validity, the method has been compared to five other widely accepted measures: scaling, substitution, grouping or classification, judgment of relationship, and semantic-differential. It has also been reviewed by a panel of independent researchers and found to be a valid instrument in the assessment of organizational factors, especially culture and proclivity for performance. The STORM Index method of measurement has been assessed for reliabilitythrough content analysis of meaning components by specific assessment of inter-judge reliability; the psycho-cultural similarity measure by split-half assessment; the dominance hierarchy measure by a test-retest assessment, the measure of affinity structure by split half comparison, and the evaluative attitude index by the inter-judge method. Statistical analyses of reliability produce correlation coefficients r = 0.86. Until the STORM Index was developed, no systematic, theoretically coherent methodology existed to explore the many dimensions of a workforce’s belief system. Studies incorporating the methodology indicate the quality of results match or are superior to those measures that have attempted to address organizational culture, workplace stress, and organizational performance. The STORM Index permits intensive in-depth empirical assessment where previous assessment was either highly qualitative or cursory and partial.